The Vandals were an East Germanic tribe. They entered the late Roman Empire during the 5th century. 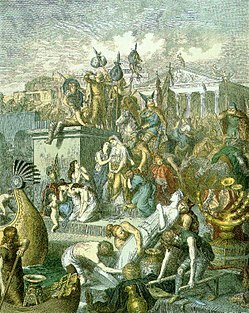 The Vandals may have given their name to the region of Andalusia, which according to one of several theories of its etymology was originally called Vandalusia or land of the Vandals. This would be the source of Al-Andalus — the Arabic name of Iberian Peninsula, in the south of present-day Spain, where they settled before pushing on to create a Vandal Kingdom in North Africa. The Goth Theodoric the Great, king of the Ostrogoths and regent of the Visigoths, was allied by marriage with the Vandals, as well as with the Burgundians and the Franks under Clovis I.
Byzantine Empire forces under Justinian I conquered the Vandalic African kingdom in 534. ↑ Dozy, Reinhart P. 1881. Recherches sur l'histoire et la littérature des Arabes d'Espagne pendant le Moyen-Age. This page was last changed on 13 August 2018, at 11:14.